There’s a roof on the world and it needs new shingles. I was a little over-optimistic back in December when I said the first new Papa Ghostface album in thirteen years was almost finished. There was more work left to do than I thought there was, and some songs needed a little more time to marinate before they figured out what they wanted to grow up to be. But now we’re very much in the home stretch, and if all goes well the album should be a finished, physical thing you can hold in your hands and listen to a few weeks from now. 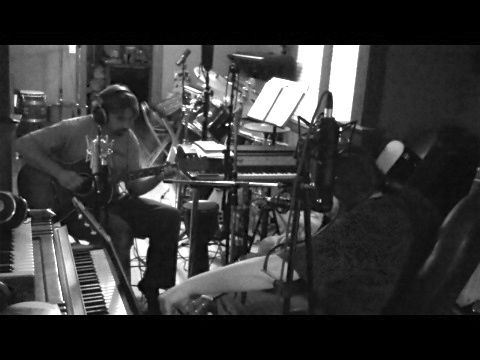 There are fifteen songs, and they range from industrial sludge, to laid-back jazzy grooves, to dreamy mood pieces, to acoustic guitar-driven kinda-sorta progressive rock-ish-ness, to our take on something crawling toward bluegrass, to the obligatory PG spoken-word track. For all of that, it feels like maybe the most cohesive album we’ve ever made. The striking cover art Greg Maxwell made (see above) was not at all what I was expecting. I sent along some rough mixes and kind of left it up to him, giving little direction aside from saying, “Something wild and psychedelic could be fun.” But the more I think about it, the more I can’t see any other image fitting any better. These are not light, optimistic songs. There’s a lot of death and searching in them. Bird bones on the floor of a flooded desert, framed by water lilies…that feels like just the right mixture of dark and pretty to match the music. Greg told me some of the songs made him think of an Acid Western. I like that. I think you can extrapolate it a little and treat the whole thing as the soundtrack to an Acid Western film that doesn’t exist. There’s a dusty, folky quality to several of the songs, but I don’t think it’s straight alt-folk any more than CHICKEN ANGEL WOMAN was. The main thing is, the banjo and the ukulele get some long-overdue love after they were given short shrift last time out on GIFT FOR A SPIDER. This is an album of a few firsts. 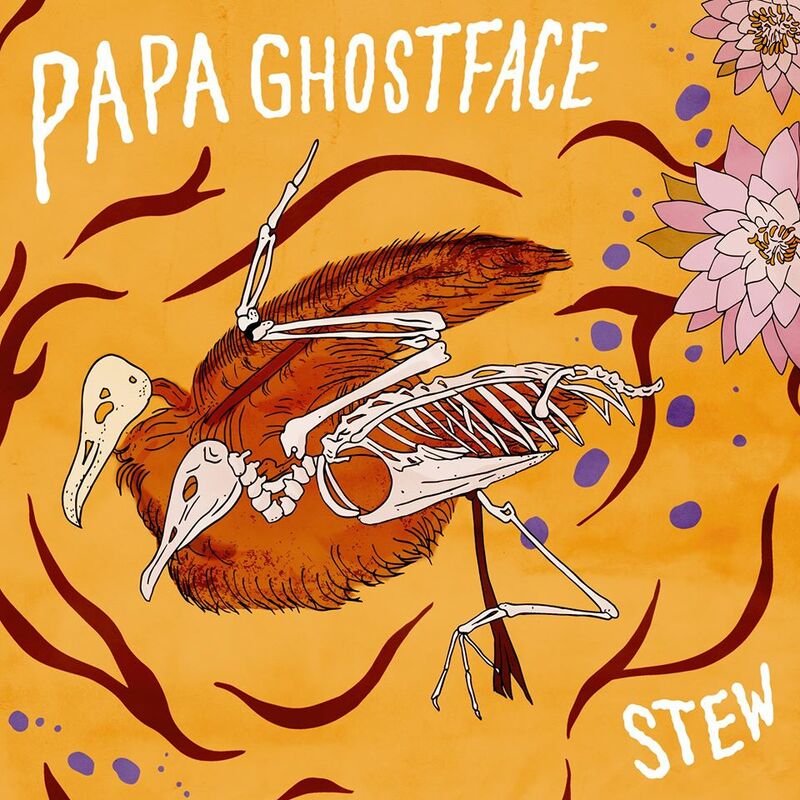 It’s the first Papa Ghostface album to clock in at under an hour (I don’t count LIVE AT SILVERS, because that’s more of a half-hearted goof-off session than a real album). It’s the first to feature anyone other than me and Gord doing anything — in addition to Greg’s artwork there’s some saxophone magic from Theodore Hogan and some violin magic from Stu Kennedy. It’s the first to feature real acoustic drums all the way through in place of the drum loops of old. And I’m pretty sure it’s the first thing we’ve done that doesn’t have a single dirty word or bizarre sexual reference waiting to jump on you. A PG album you can play for the whole family. Who saw that coming? If we play any live shows, it’ll either be a stripped-down, unplugged acoustic thing (probably at Taloola or in someone’s living room), or else we’ll go all-out and put a proper band together. I don’t think there’s any in-between. I’m not sure what’s happening there, because playing live isn’t really my thing these day, but I’ll keep you posted either way.